ASP Gen. Trias Chapter, with the collaboration of its officers and parents held its pilot activity last July 03, 2010 entitled “Understanding the Child-- An inspirational Talk and Early Detection Seminar”. The seminar was also in line with the 32nd NDPR Week celebration, which aims to educate the public on the rehabilitation of persons with disabilities. 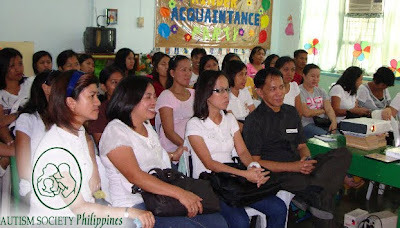 The said event was supported by 33 participants, most of whom were parents of children enrolled at the Early Wings Behavior & Therapy Center in Gen. Trias, Cavite. 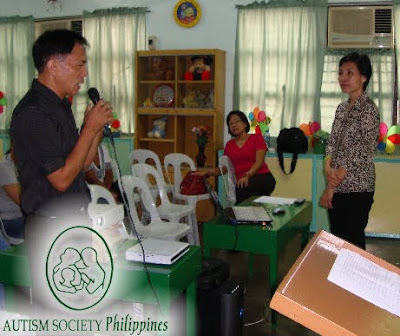 ASP Cavite Chapters “Gobernadora”, Jan Peňa, who also heads the ASP National’s Membership Committee, was the guest speaker. Jan is a Bachelor of Arts, Major in Psychology graduate of the University of the Philippines, with Masteral Units in Educational Management at the De La Salle University, Manila. She discussed the manifestations for Early Detection of a Child with Disabilities. Furthermore, she openly shared the clippings of her own child’s activities to encourage the parents to support their children’s talents and skills. The seminar opens the door for greater awareness on persons with disabilities. Feedback from parents who attended the seminar resulted to having a more sense of understanding, patience and true acceptance of their own children. ASP continues to work hard to educate the public on autism awareness. To request for an Early Detection and Early Intervention Seminar in your area, write us at autismphil@pldtdsl.net or call 9266941 / 9298447.